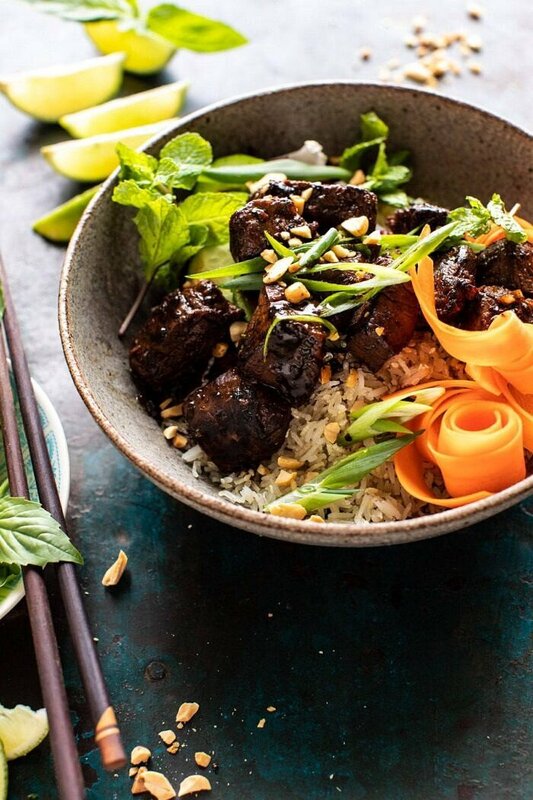 My go-to, 30 Minute Vietnamese Beef and Crispy Rice Bowl. 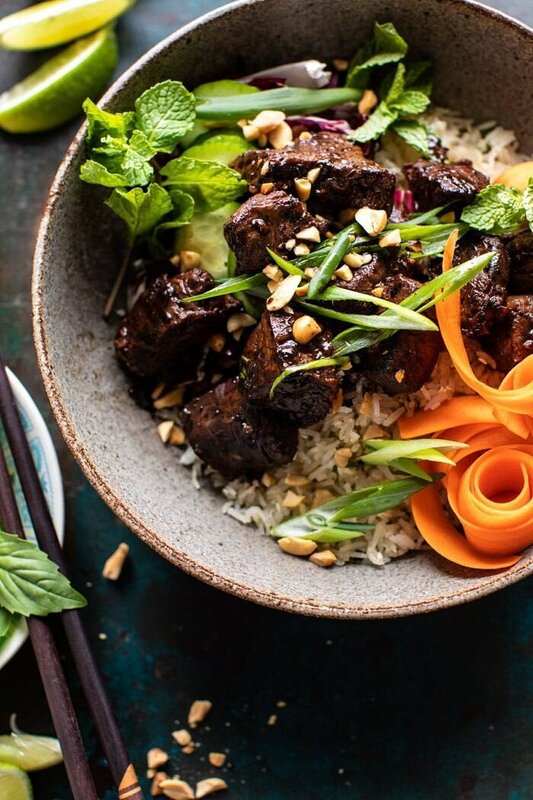 Peppery, spicy, sweet, and tangy, this Vietnamese inspired stir fried beef has crispy rice, veggies, and plenty of fresh herbs. It’s colorful, super quick, and addictingly delicious. The best part? It’s all made in just one skillet and comes together in about 30 minutes. A great fresh and flavorful dinner for any night of the week. 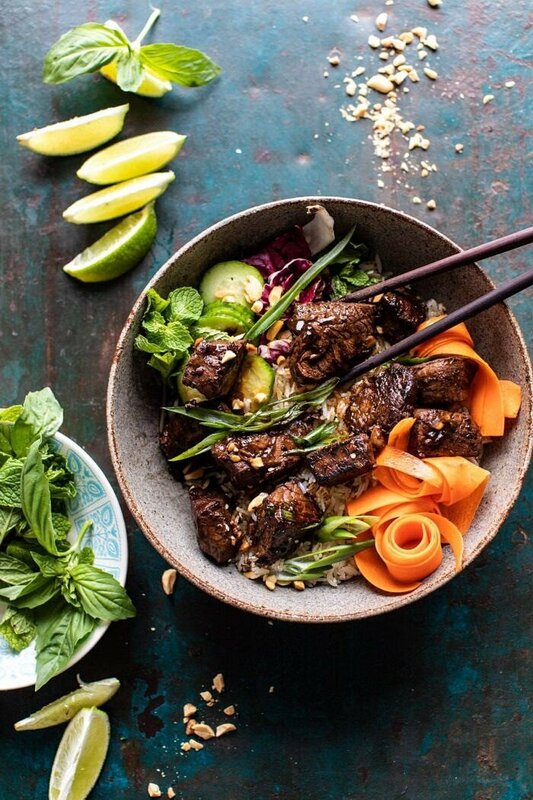 If there was a dinner that my family could eat week after week, it’s this Vietnamese beef bowl. Most of my brothers are the very stereotypical guy’s guy when it comes to eating. They love their chicken and steak, and prefer their veggies in potato form. I wish I was joking, but it’s all true. Thankfully most of their pallets have matured as they’ve gotten older (not sure they have though) and they do eat a pretty colorful…ish diet these days. I like to think that I was a major part of this. Anyway, it might be surprising, but it’s not a given that I’ll make a recipe my brothers with actually love. Sure, I make some of their favorite foods for them when they are here, but a lot of those foods will never see the light of day here on HBH. Some of them tell me that many of the recipes I make are too veggie focused or “weird” for them. But then there are recipes like todays. Today’s recipe is one they love, and that makes me so excited. As I’ve said many times before, my favorite thing to do is cook for others. I love being able to so easily please the people I love most with a simple recipe. It’s truly my favorite thing…which is why, during the holidays, I end up playing not only cook, but often bartender too (because most of my family members love their steak and their cocktails). Anyway, point is I am finally making a recipe my brothers will approve of, and that’s something I’m happy about today. Also? I’m just excited to share this recipe with you all! I can’t really pinpoint my exact source of inspiration for this recipe, other than the fact that I’ve just really been craving these fresh flavors. Lots of fresh herbs, spice, limes, and salty, tangy sauces. To be honest, I had some beef in my freezer and found everything else in my fridge/pantry. That’s kind of how this recipe came to be. Not the best story, but it’s true, and it’s recipes like these that are always my favorite. First things first, the crispy rice. You probably cannot tell, since it’s hiding underneath all the veggies and beef, but yes, my rice is indeed crispy, and it’s very good. Up until this recipe I’d never made crispy rice at home. But after realizing how simple and easy it is to make with leftover rice (which I almost always have on hand), I will be making it often. As the rice crisps it takes on a more toasted flavor and lends a nice crunch. 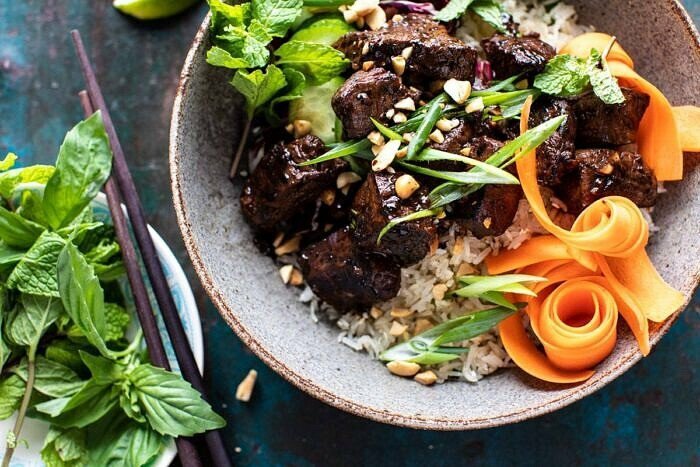 It’s a fun switch up from your average steamed rice. Once you have the rice crisped, move onto the beef. Now, I want to discuss the cut of beef you should use. I used very high end beef tenderloin, BUT only because this is what I happened to have in my freezer. Yes, it’s beyond delicious, melts in your mouth, and you really can’t mess it up. That said, I understand that most of you may not want to shell out the cash for beef tenderloin. If that’s the case, no worries. Use a very affordable flank steak. It really does work just as well. 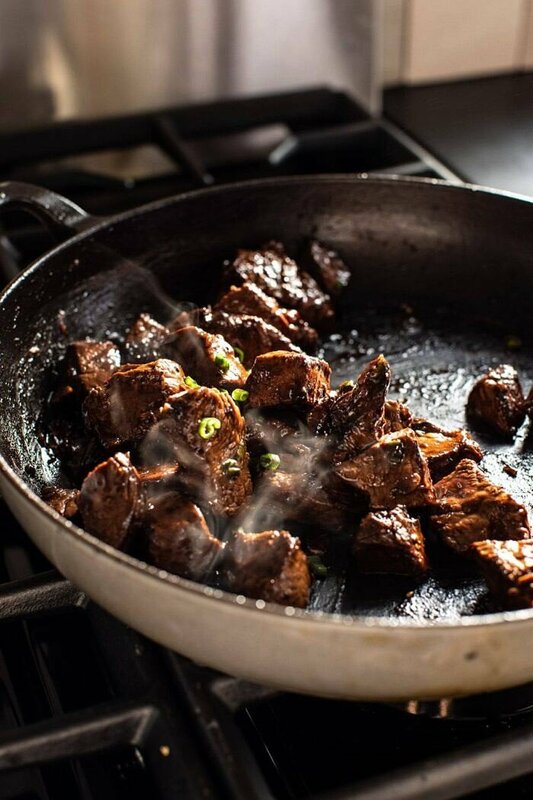 I pan cooked the beef and then tossed in a little sweet, salty, and slightly spicy sauce. This nicely glazes the meat and it’s really delicious. The two key ingredients here are oyster sauce and fish sauce. You can usually find both in the Asian isle at most grocery stores. At this point, it’s assembly time. I layered my rice and beef with radicchio, carrots, and lots of fresh basil and mint. You can really use any combo of vegetables you’d like though. If you are looking to add another layer… Yes, I do think a crispy fried egg, or even a soft boiled egg, would be really good here. I know it’s a bit early, but this bowl almost reminds me of a springtime recipe. It’s kind of cozy, but still colorful and fresh. So the perfect balance. 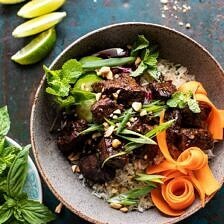 If you make this Vietnamese beef bowl, be sure to leave a comment and/or give this recipe a rating! Above all, I love to hear from you guys and always do my best to respond to each and every comment. And of course, if you do make this recipe, don’t forget to also tag me on Instagram! Looking through the photos of recipes you all have made is my favorite! 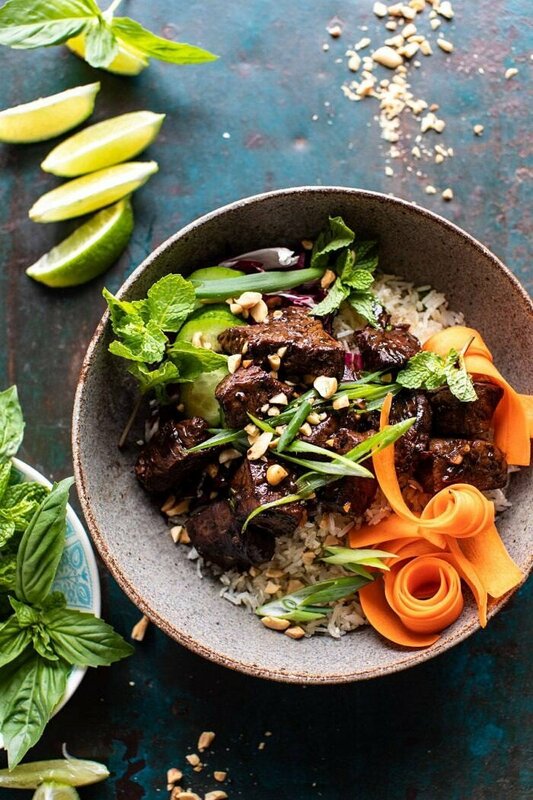 Peppery, spicy, sweet, and tangy, this Vietnamese inspired stir fried beef has crispy rice, veggies, and plenty of fresh herbs. It's colorful, delicious, super quick, and made in just one skillet in about 30 minutes. A fresh and flavorful dinner for any night! 1. Season the steak all over with pepper. 2. In a medium bowl, whisk together the oyster sauce, honey, soy sauce, fish sauce, garlic, and a pinch of crushed red pepper. Add the beef and toss to coat. 3. Heat 2 tablespoons oil in a large skillet over high heat. When the oil shimmers, add the rice and season with salt. Toss to coat in oil. Press the rice evenly across the bottom and up the sides of the pan. Let cook, without stirring, until the rice begins to turn golden brown, about 3-5 minutes. Spoon the rice out of the pan and onto a plate. 5. 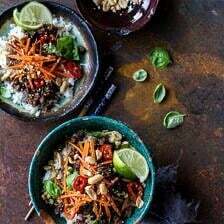 Divide the rice among bowls and top with cabbage, carrots, and cucumbers. Spoon the beef and sauce overtop. Squeeze with lime. Top with green onions, basil and peanuts. Eat! *Beef tenderloin is going to be more tender, but if it's too pricey, flank steak works well too. Wow I can’t wait to make this! Also i just want to say you are the only person who can make a bowl of raw beef look beautiful haha. Haha you’re too sweet! I am so glad you like this and I hope it turns out amazing for you, Sarah! Thank you! Looks AMAZING! Does the flank need to be marinated at all, considering it is a much tougher cut than the Tenderloin? 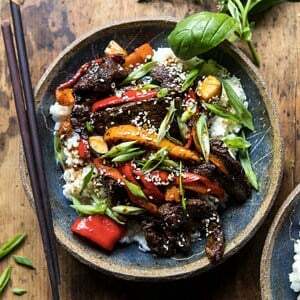 Thinking about making this for dinner except with tofu! Whaddya think? So looking forward to making this one. Gorgeous and delicious. This is a delicious recipe! Never had an Asian bowl of yours that was anything less than amazing. Made this tonight for dinner, it came out perfectly. The flavors were delicious and the color of the vegetables were stunning. I want to put this meal in my bi-weekly rotation. Thank You! 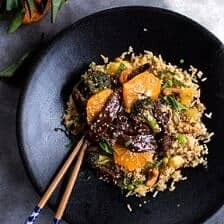 Bookmarked this – my boyfriend and I love your Asian-inspired 30 minute bowlfuls and I know he’ll love this beef – though I’m going to have to switch up the veggies as he won’t eat either cucumber, or anything raw! And I totally get what you mean about your brothers – regardless of what kitchen i’m cooking in either my boyfriend or my father wants to know why I have to do so much ‘weird stuff’ to my food! Haha I am so glad you understand! Also, so glad you and your boyfriend loved this recipe, Rachel! Thank you!! I made this tonight and it was delicious!! Tieghan, I love all your recipes. Your sweet and savory approach to cooking is just what I like. Thank you for your great recipes and wonderful pictures! I made this recipe last night! So so good! I did not have oyster sauce, used coconut aminos instead of soy sauce, and it still turned out amazing! My husband had 2 servings, he devoured it. I also added cilantro and steamed broccoli. So many flavors and textures. I do have to note that in my opinion tenderloin is really what makes this dish over the top, it’s so juicy and tender. Will def be making this again and again! What could you substitute for the fish and oyster sauce? Honestly one of my favorite things I’ve made recently! We even used brown rice and it was delicious! I added in some quick pickled red onions. Delicious! Three Thumbs up! My boys ages 12, 14 and 50 devoured this recipe! They loved it!! I steamed broccoli and placed in the bowl with the tops pointed up. Then poured the sauce over the top of the broccoli and steak…. bowls are empty! THANK YOU! This recipe will not be on rotation! Made this for dinner tonight and my husband and I loved it! Tasted so fresh and had lots of texture. And quick and easy! I made this tonight and it was SO good! IS it normal for the rice to “pop” while you are cooking it? The moment it hit the oil in the pan, the rice & oil started spattering and popping like crazy! This was delicious! Thanks for the great inspiration! THIS WAS DELICIOUS! I made it last night with a flank steak, and had pre-made the rice on my lunch, so when i got home all i had to do was fry up the rice, do the marinade and cook the beef. I following the cooking instructions exactly and the meat was done perfectly. Served it with a coleslaw using the GOOP Vietnemese salad dressing (https://goop.com/recipes/vietnamese-dressing). So good i want to make it again tonight! This was a hit for Valentine’s family dinner. I used filet with mint. All of the flavors came together really nicely. The beef and sauce was a little rich but with the lime and mint it was great. I would definitely make it again. This recipe is so delicious!! The crispy rice is something else! I’m making it for a second time for my grandma, who I know is going to love it!! Really really yummy! We couldn’t find oyster sauce, so subbed extra soy sauce instead. I imagine that made the sauce a little more “loose” than was intended in the recipe, but it was still so delicious! We also used cauliflower rice instead of white rice — crisped it in sesame oil as suggested, and it was great. Just as satisfying as rice. Will be making this again! This recipe is flawless and have made it 2 weeks in a row. 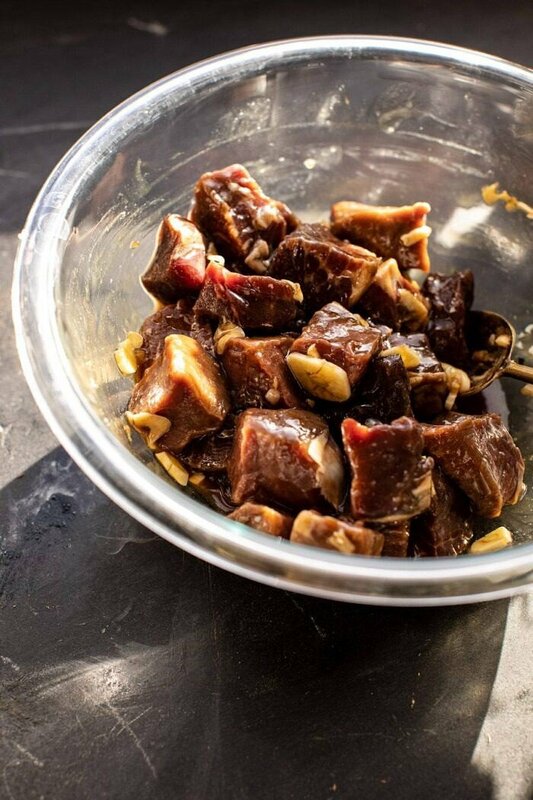 We started by doing a marinade with the sauce and double up on the amount of sauce to add later. Only thing we added differently was some sambal! The whole family loved this recipe. Thanks again. May I ask why is so hard to cook the flank steak, especially the inside? How can I cook it faster? If I replace oyster sauce to Hoisin sauce, does it make a big difference? Please answer as soon as possible! I would like to cook for my boyfriend tomorrow and is doing a sample cooking right now? Thank you! Hi Sophia, I am not sure I understand what you are asking? Is the steak not cooking for you? How long is it taking? What heat are you using? 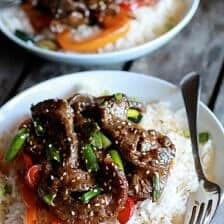 The boyfriend and I have been trying your Asian inspired dishes lately and this is BY FAR his favorite! The flavors are beyond this world, we’ll definitely do it again! Delicious and easy! I did marinate the meat over night and the flavor was so so good. Will be making again and for others for sure! The flavors are perfect.